Titi Lamositele (No. 3) of Bellingham, WA, squares off against Samoan defenders. 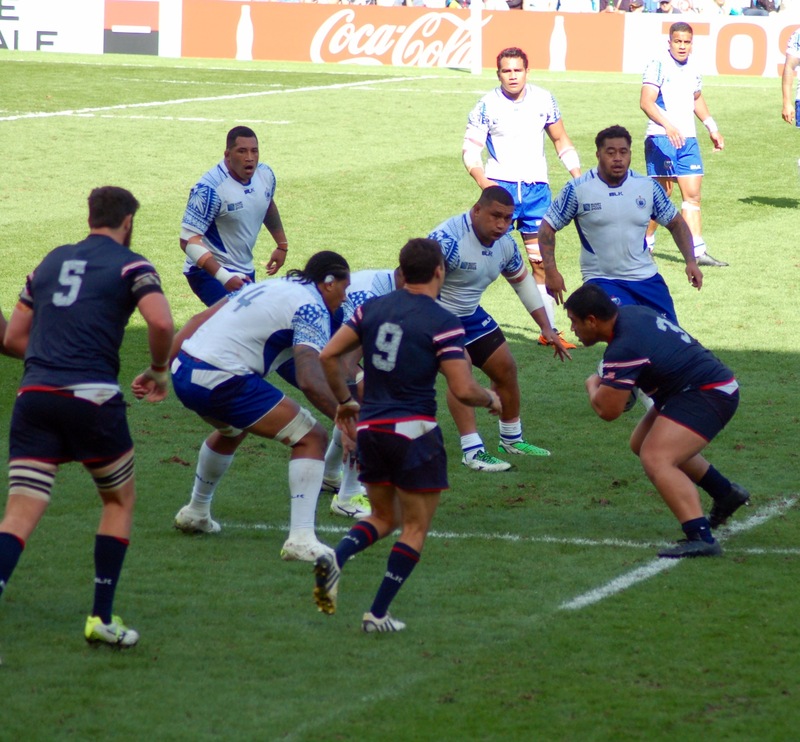 “We were masters of our own misfortunes” was how Justin Fitzpatrick, forwards coach for the U.S. national rugby team, summed up the Eagles’ loss to Samoa on Sunday. Too many penalties, too many movements left unfinished, a couple of missed kicks and some failures at defense resulted in a 25-16 win for the Pacific Islanders. Mike Tolkin, the U.S. head coach, was asked at the post-game media session what the Eagles would do differently in their next game. He went on to say more discipline and more continuity were what he wanted from his team this coming Sunday against Scotland. The Eagles gave up 15 points in penalties. “At the end of the day, we were still in position to win but could not finish,” Tolkin said. He said he was also disappointed that they missed out on getting a bonus point from the match. Teams receive one point in the standings for a loss of seven points or less. With the U.S. trailing 22-11 with only 11 minutes left in the game, a try would have put them within six. Then the Eagles were called for crossing, essentially blocking, which is not allowed in rugby. Samoa added three points with the penalty kick so that when Chris Bauman scored a five-point try — three minutes after he entered the game as a sub — it needed to be converted to get the Eagles within seven. Alas, the kick, would have added two points, went wide. On Wednesday, Scotland plays Japan, who shook up the tournament – Pool B especially – with their shocking upset of South Africa on Saturday. Tolkin said the upset might cause Scotland to re-think what players they select for Wednesday’s game. Scotland might have been tempted to hold out some of their best players against Japan. But after Japan’s 34-32 win over the Springboks, that would seem unwise. So when the U.S. plays Scotland on Sunday, Sept. 27 in Leeds, they may face a team of players with only four days rest while the Eagles will have had a week to recover. And what about South Africa, the Eagles’ Pool B opponent on Wednesday, Oct. 7? Any word on how the unexpected loss has affected them? 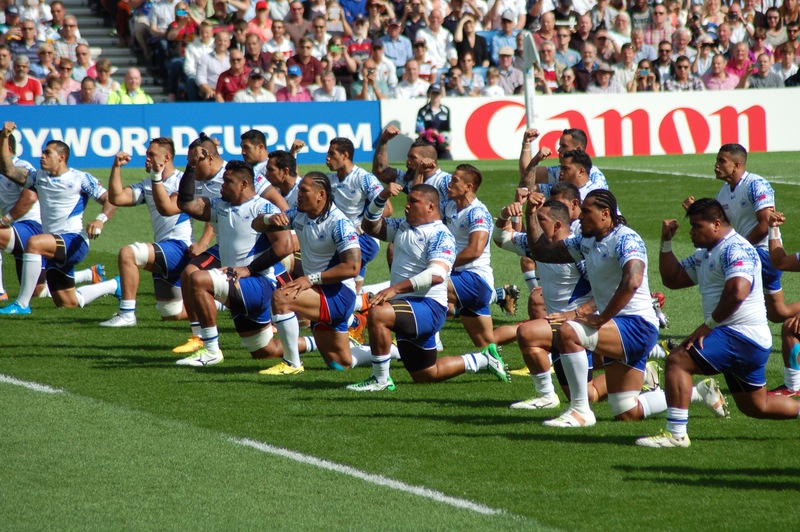 Posted on September 21, 2015 September 21, 2015 by jbsaulPosted in RugbyTagged England Rugby 2015, rugby, Rugby World Cup, RWC, Samoa, US Eagles, USA Eagles, USA Rugby.